You are here: Home / General Interest / Hiwassee: A Floral Delight! The New River Trail provided a welcome dose of colorful spring flowers for the members of our New River Chapter and their friends last month. 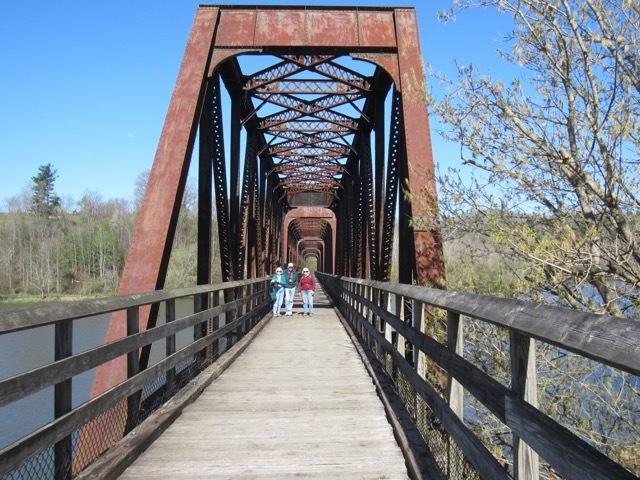 This trail is is actually a 57-mile linear park that follows an abandoned railroad right-of-way paralleling the scenic and historic New River. Old rail beds make gentle hiking and the blooms of our native wildflowers made the day doubly delightful. Chapter President, Mary Rhoades was kind enough to share this account of the chapter field trip. New River Trail State Park can be rather barren of natural vegetation, but the section from the Hiwassee parking lot north rewards the visitor with a wealth of native flowers. Vicky Barden was our trip leader that day. We began by crossing the large bridge over the New River. On the other side we walked for about one mile. Along this part of the trail there is a steep slope on one side of the trail that is covered with flowers in mid-April. 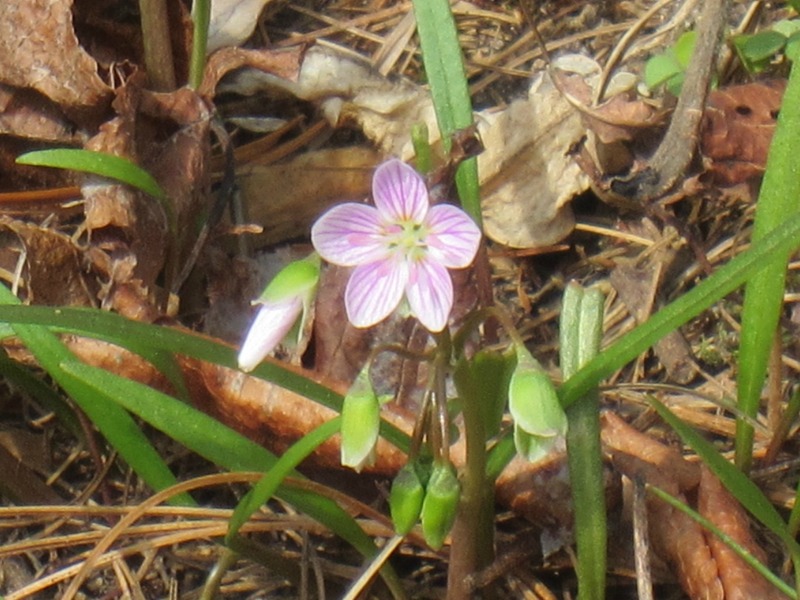 A profusion of spring beauty, (Claytonia virginica), greeted us at the start of the trail, and continued for the entire way on the level ground next to the trail. The spring beauties formed a massive carpet of pink as far as you could see under the trees! On one section of the slope there were hundreds of Dutchman’s breeches, (Dicentra cucullaria). At another point the slope was covered with squirrel corn, (Dicentra canadensis). 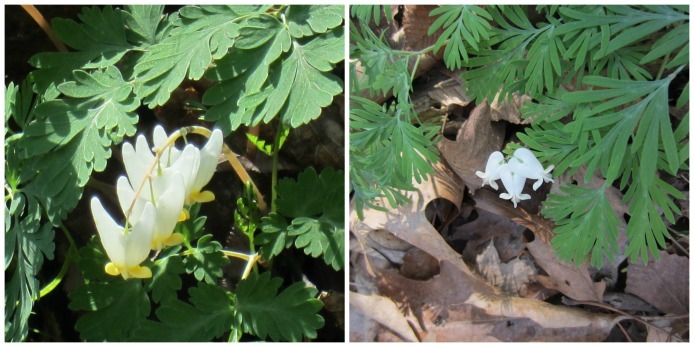 Dutchman’s breeches on the left, Squirrel corn on the right. We met a couple from Greensboro, NC, hiking on the trail. They asked us what the tree with the pink blooms was. It is hard to believe anyone who lives in the South does not know the redbud, but it gave us an opportunity to give a small lesson about plants! So, sometime when you are traveling through Pulaski County, check it out! Montgomery, Pulaski, and Wythe; towns of Blacksburg and Christiansburg; city of Radford. All of our chapters welcome the public to attend their meetings, programs, and field trips!